When we began working in Matagalpa, Oscar was in the fourth grade. He was a shy boy, with a bright smile and we were all sure he was headed for a bright future. After finishing primary school, Oscar began high school, though adolescence and family difficulties became obstacles. He dropped out of high school during his first year, which was sad and frustrating for all of us. He tried again a second time, the following year, though he again withdrew from school when some personal situations got to be too overwhelming. Oscar began to work as an apprentice in a carpentry shop, but that option also proved to be unsuccessful. We were all concerned about Oscar and seeking new ideas, to help guide him in his development. He is a committed member of Young Life, so his faith is strong, though he had not found the right opportunity for his personal growth and development. Finally, we found the solution: bamboo. We had a chance to send two people to a training program, to learn how to make crafts and furniture from bamboo. With his experience in carpentry, we thought that it might be the ideal opening for Oscar…and it was. He became immediately enamored with the bamboo project and demonstrated an incredible amount of skill. Oscar is now heading up our new bamboo workshop, and training five other young men to work with bamboo. They have already started selling some of their designs in local markets and fairs. We are so happy that Oscar finally found his niche and is making great progress towards becoming a skilled craftsman. We still hope that he will get his high school degree, though for the time being, he is steering clear of risks and working hard. This entry was posted in Uncategorized on August 22, 2017 by Scott Finlayson. After several months of planning and research, the rain harvesting project is finally complete. We had great support from our partner organizations, Sirviendo FAITH Foundation and Tin Roof Foundation, who helped to make it a reality. 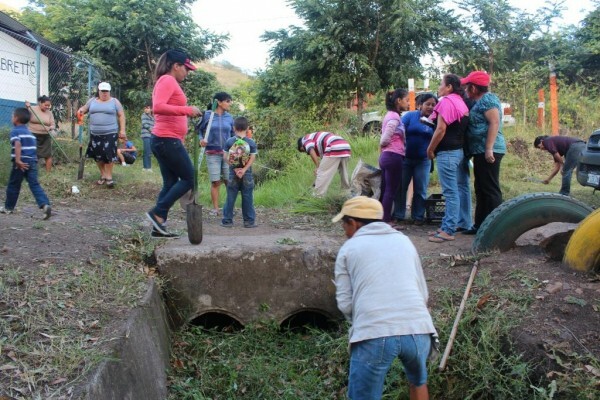 Although we had originally planned on installing water systems for 30 families, we ended up including 43, as well as both public schools in the communities Cerro de Piedra and Las Lomas. Both of these communities suffer from severe water shortages and we determined that the most feasible way to provide some alleviation from this situation was by installing rain harvesting systems. This would allow the families to capture rainwater during the long rainy season and store it for the dry season. We developed a design that was both practical and affordable. Installation of the systems began in July and were completed within a month. Since it has been raining heavily this season, most of the tanks are already full. The families are currently using the water, as it saves them from walking great distances to retrieve water for their basic needs. They will allow the tanks to fill up at the end of the rainy season, so they will have an adequate supply for the dry season. We are so grateful to all of the individual and institutional donors that made this project possible. For a more detailed report of the project, download the final report here. Juan Carlos is five years old and lives with his mother and sister in the community Las Lomas. He should have been in preschool this year, but since the school in Las Lomas is very small, they were not able to open a community preschool this year. His mother works all day though, to support her children, so it was also difficult for her to find someone to care for Juan Carlos during the day. 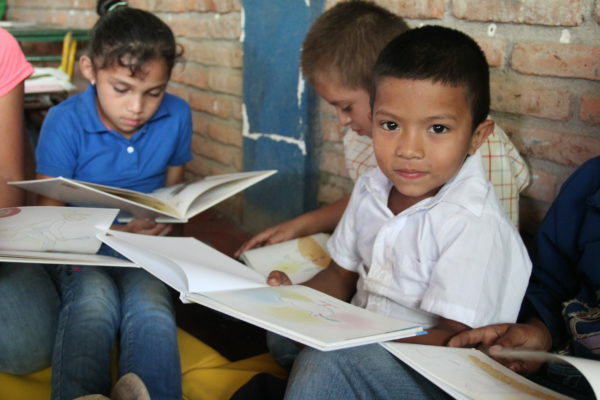 After some creative planning with the school’s only teacher, special arrangements were made in order for Juan Carlos to be able to begin to attend school. Although the school year was already in session, he started classes in July, at the beginning of the second semester. His first day of school happened to be the day that our staff was creating a new reading corner for the school in Las Lomas! That day, all of the students helped to clean and organize a corner of their classroom, in order to make space for a small library. Shelves were painted and installed, cushions were arranged on the floor and most importantly, our staff brought a collection of more than 100 books. It’s safe to say that it was the first time that Juan Carlos had ever held a book in his hands. He marveled at the illustrations and listened attentively as the older children read him stories. We are certain that he will turn into a great reader before the end of the school year. We will have to work closely with the teacher in Las Lomas, to ensure that Juan Carlos gets a solid foundation during the rest of the year, but his enthusiasm is contagious. This summer, we were extremely fortunate to host mission groups from Cincinnati and Atlanta. 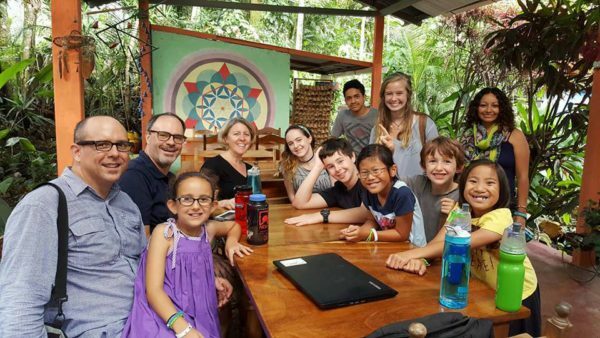 These groups come to share their talents, their joy and their compassion with children and their families in Nicaragua. It is always so inspiring for us to see how selflessly people come to serve and to build relationships in Nicaragua. It is an excellent opportunity to build bridges of understanding and also to share our common experiences, as children of God. These were the groups that graced us with their presence, their energy, and their compassion. 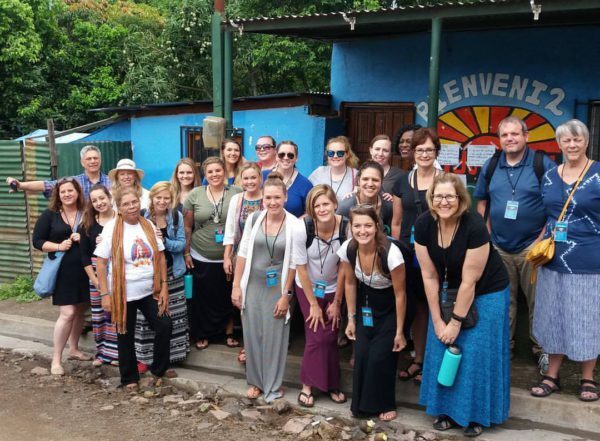 A group of 22 educators visited us from Crossroads church and provided a week of training for more than 100 Nicaraguan teachers. They also helped to paint and build a new kitchen at the Edmundo Castellón school. 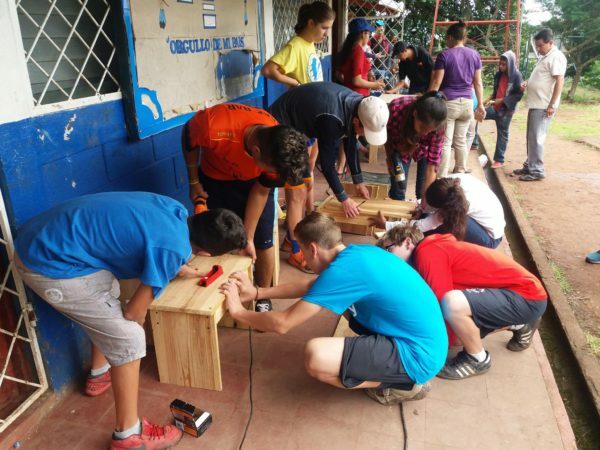 Thirteen people, adults and children, visited from Stonebridge Church, helping to create a new library and garden space at the 15 de Septiembre school. The murals in the library are simply amazing, divinely inspired! Montgomery Community Church sent a team of 20 to help construct a new kitchen and create a new library at the school in El Carrizo. This group also planned a whole week of amazing games, art projects, and workshops with parents with their friends in El Tule. Although it was sad to see them go, we are looking forward to working with these mission teams, and many more, next year. 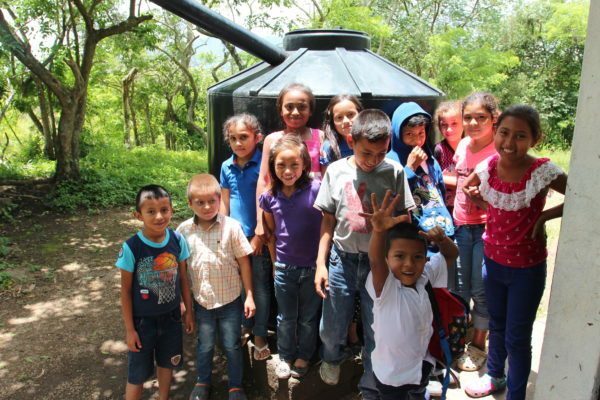 If you’re interested in organizing a visit to Nicaragua through your church or school, contact us today! We had a fantastic year in 2014, but we are certain that 2015 is going to be even better. We have started the new year with vacation camp activities for both primary and secondary students. Since school doesn’t start back until February 9th, we are organizing sports leagues, art classes, games, movies and maintenance. Last week we invited all of the parents to come and help us clean up for the day, to get ready for the new school year. There was an amazing turnout and in just a few hours, we got the school cleaned up and in great shape. We are looking forward to a year of great fun and success! This entry was posted in Uncategorized on January 13, 2015 by Peter Schaller.